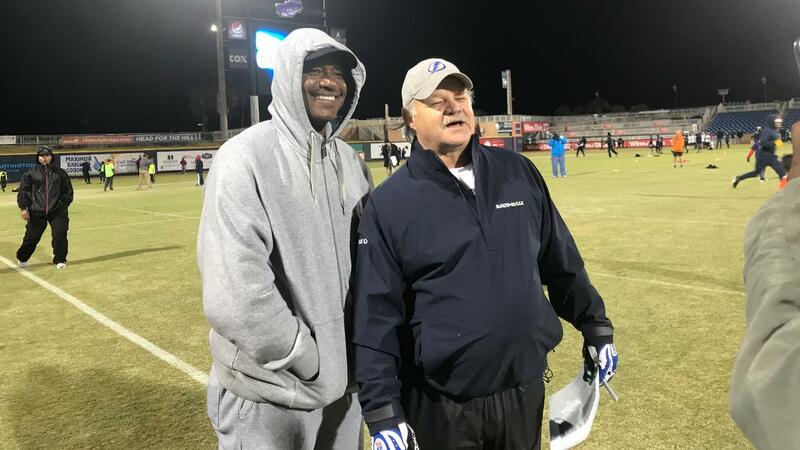 NFL Hall of Famer Derrick Brooks (left) with Studer55 head coach David Wilson. This whole idea of a youth flag football league at Blue Wahoos Stadium began four years ago on a hunch and some hope. Derrick Brooks took care of the start-up costs. He wanted a way to reach kids and give back to Pensacola, after growing up in the community, then rising all the way into the Pro Football Hall of Fame as one of the NFL's greatest linebackers. Blue Wahoos team owner Quint Studer was on board to provide the stadium access and assist in other ways. The rapid development has far exceeded anyone's expectations. The season championship for NFL Flag Pensacola, presented by Studer/55 Community Athletics was Friday night at Blue Wahoos Stadium, ending a successful fourth season of the league. More than 290 kids on 32 teams participated in 2019, the first season the league was incorporate by the NFL into their youth flag football program, triple the number from the inaugural season. "We didn't know where this was headed, and we naturally had bumps along the way, but to see it grow like this has been very impressive," said Dave Wilson, the coordinatorand director for Studer/55 Community Athletics. "Derrick has been tremendous through it all because in those first three years he was paying the bill for just about all of it," Wilson said. "All he's ever wanted is to say, 'Hey, we need to provide this for the community.' And he has stuck with that. It's something he wants to continue see go." It may go beyond Pensacola. Inquiries from Fort Walton Beach and Destin, along with Pace and Milton have been made to expand the league. By joining with NFL Flag and the organization's connection to the NFL, players are provided authentic NFL team jerseys and made to feel special. "Their jerseys are just like guys playing on Sunday wear. And it's a reversable jersey. So you never have a conflict of two teams looking very similar. "The flags are much better. Everything has been an upgrade in quality." Players from the University of West Florida football team have volunteered time to help referee games and provide instruction for the kids. Midway through this season, Wilson evened the playing field. He divided the 32 teams into a "rookie" league and "veterans" league based on experience and skill. Friday's championship night will have eight winning teams divided in the two divisions. The league has four age divisions: Kindergarten through second grade, third-fourth grade, fifth-sixth grade and seventh-eighth grade. "I took the win-lost records, because I could see there was a disparity between the experienced teams and the kids experiencing this for the first time," said Wilson, whose has an extensive coaching background with area high schools and college football. "I've seen a lot of growth from that." He worked for Brooks as the player personnel director of the Tampa Bay Storm, back when it was a member of the Arena Football League. Moving forward, Wilson would like to have an instructional league to teach participants. He hopes to have an NFL Flag tournament with 16 teams in Pensacola. Wilson will attend the USA Football National Conference Feb. 22-24 in Orlando to gather more ideas. "They want to know some of the stuff we are doing, because we are doing things a little differently… and some things I want to learn," he said.